Domain Keys Identified Mail (DKIM) helps you protect your company from email spamming and phishing attempts. It provides a method for validating a domain name identity that is associated with a message through cryptographic authentication. For a complete description of DKIM, see the link to recommended DKIM sites in the “External resources” section at the end of this article. Note: The method described in this article differs from the way DKIM is set up for Rackspace Hosted Email and Exchange customers. If you are a Rackspace Email, Hosted Exchange, or Office 365 customer, contact the Rackspace Cloud Office team for help configuring the proper DKIM, DMARC, and SPF records. Choose a simple, user-defined text string to be your DKIM selector. The selector is appended to the domain name to help identify the DKIM public key. Generate a public-private key pair by using a tool such as ssh-keygen on Linux or PuTTYgen on Windows. For help creating key pairs, see Generate RSA keys with SSH by using PuTTYgen. Click the gear icon next to the name of an existing domain and select Add DNS Record. In the popup dialog box, select TXT Record as the record type. In the Hostname text box, enter the selector text string that you chose in Step 1 followed by the literal string ._domainkey. 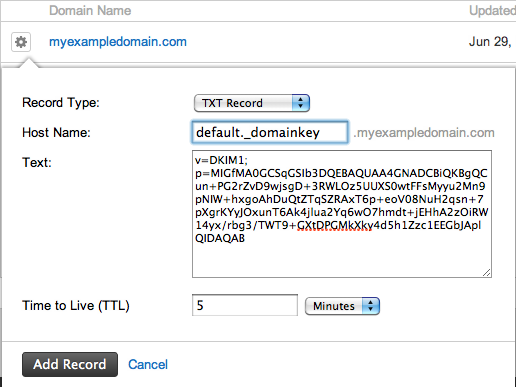 For example, if you use the default as the text string, you enter default._domainkey in the Hostname text box. The DKIM TXT record is added to your domain. For instructions about attaching the token to your outgoing email, see the Specification section at DKIMcore.org.